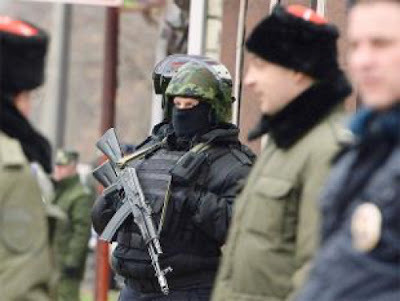 BERLIN, Germany -- Russia is running a "shadow government" in rebel-held territories of eastern Ukraine under the control of the FSB intelligence service, German newspaper Bild reported Wednesday, citing minutes from an official commission. The report said that basic administrative functions of the cities of Donetsk and Luhansk are being run by six working groups at five Russian ministries. The officials, who manage areas including tax law, transport infrastructure and the establishment of an electricity market, work under the auspices of the FSB and answer to Russian Deputy Prime Minister Dmitry Kozak, a close ally of President Vladimir Putin, according to the minutes cited in Bild. "It is notable that no members of the self-declared people's republics in eastern Ukraine are on the commission," Bild said. "They are simply informed about its findings and their political implementation." Kozak denied the allegations, with his spokesman telling independent Russian TV channel Dojd: "We have nothing to do with that... It has never been said that Dmitry Kozak deals with any regions other than those of the Russian Federation." The minutes derive from an October 2015 meeting of the so-called Interministerial Commission for the Provision of Humanitarian Aid for the Affected Areas of the Southeast of the Donetsk and Luhansk Regions. Bild quoted an unnamed secret services agent as saying that the commission's work allowed the separatist regions to function as a Russian "satellite state". Eastern Ukraine has been gripped for nearly two years in a war between government forces and pro-Moscow separatists. Russia has repeatedly denied allegations that it has active forces in the war zone or exercises direct influence over the territories, saying it only provides humanitarian aid there. The fighting has killed more than 9,200 people since April 2014 and raised alarm across eastern European states about what they see as Putin's aggressive foreign policy stance. A Western push to resolve the crisis has floundered as Ukraine and Russia have proved unable to agree on elections in the rebel-controlled areas. Kiev has expressed fears that Russia -- already having annexed Crimea in 2014 -- may try to unsettle the country further by exerting influence over Donetsk and Luhansk within a a reunified Ukraine.